Some observations I made last night while enduring a six NBA game marathon (Hornets – Bucks and the five Christmas games). 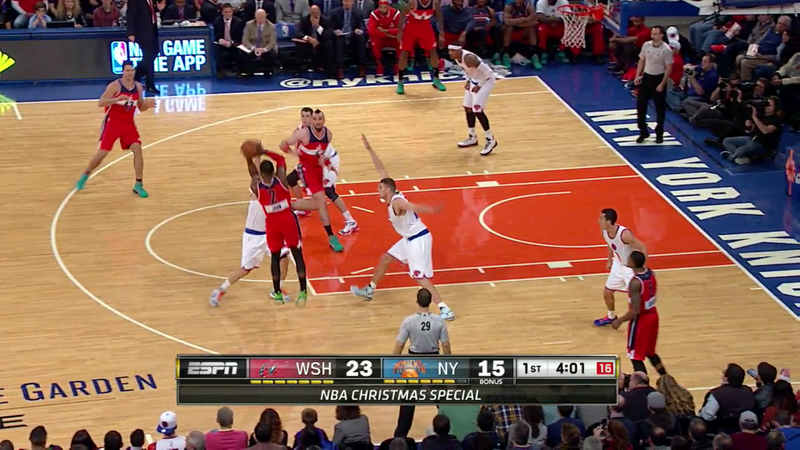 John Wall allowed me to thoroughly enjoy the Wizards – Knicks game, which otherwise was marked by Jon Barry’s utter disbelief that the Knicks are actually a bad basketball team, Quincy Acy’s temper tantrum and the overall feeling that there’s no way that New York could win this game. Wall is a master at picking defenses apart, predicting the following chain of events seconds before they actually happen. Put him in the pick-n-roll against Jose Calderon and the Knicks and an open shot is a foregone conclusion. Let’s look at this series of three back-to-back possessions which end with a John Wall pick-n-roll. His ingenious court awareness can be noticed even better in transition offense where Washington can be especially scary thanks to Wall’s speed and wings adept to run by the side-lines and station themselves for threes. The fact that Humphries was a trailer on this play was in Wall’s mind the entire time as evidenced by him not even looking backwards before actually making the pass. There’s a reason why Oklahoma can afford to do this though. They are just enough out of this world athleticism and wingspan wise to fly all over the court and force turnovers. Even though I usually don’t prefer Russell Westbrook’s style of play on defense since I rather have a guard who sticks to the overall team principles than one who gets out of position too often, he was really fun to watch last night. You could sense that around the second quarter he had seen enough of what the Spurs do in the pick-n-roll to start wandering around and intercept those Manu Ginobili passes by whom, for better or for worse, he sometimes lives and dies by, no matter the degree of difficulty on these plays. But, overall, it felt like his effort was a properly applied aspect of an aggressive Thunder defense that gave the Spurs enough difficulties to win the game. In such situations as the last one, Manu would have enough savvy and height to attempt his signature pass where he hangs in the air long enough to see to which team-mate the weak-side defender will commit to. 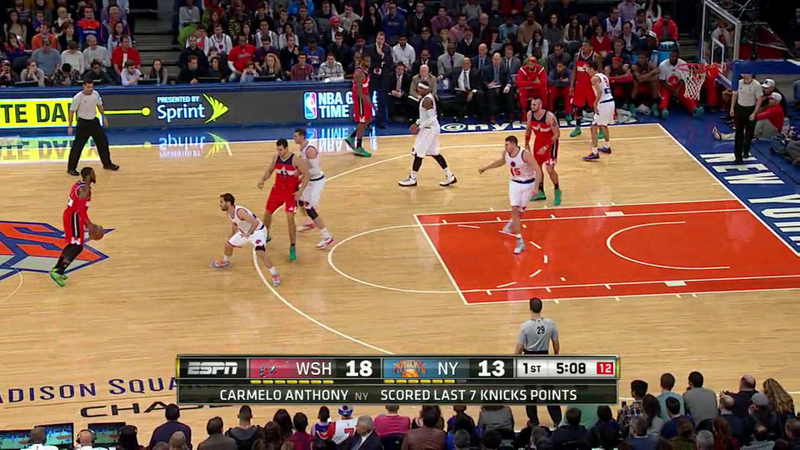 Put Marco Belinelli in such a play and it ends differently. Great win for the Westbrook and Adams-lead Thunder. Just to get it out of the way, I won’t go the obvious route and point out how bad Kevin Love is at defending the rim. Yes, he just can’t do it. By my observations, the Cavaliers are in a bad spot when the pick-n-roll is run against the other big thus leaving Love as the sole rim protector. They might have to think about toning it down a bit as their ultra-aggressive hedging just might not work with this personnel. It has produced results only in small stretches and that’s because it’s hard for them to summon initial hedges and traps smothering enough to make up for Love’s inefficiency if the offense does indeed break down those traps. 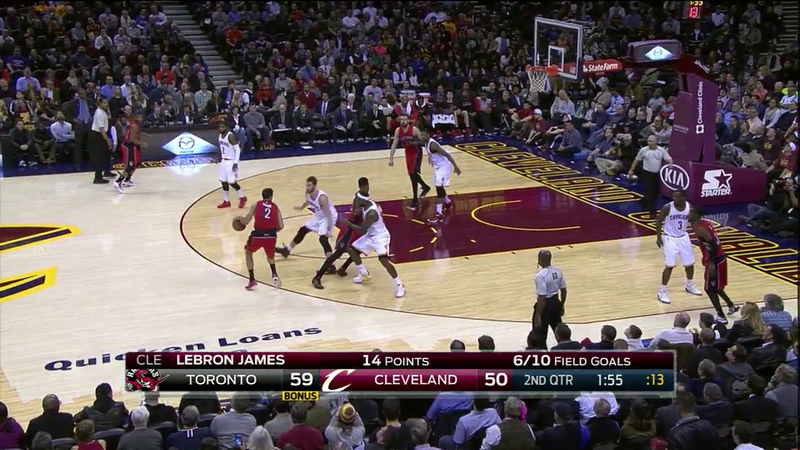 I also won’t go on about LeBron visibly saving energy on defense. There have been enough examples of that around the internet for you to get the picture. Something to monitor when watching Cleveland play in the future. Draymond Green was just great when defending in the post. Happy Holidays to all of my readers out there! I hope you had a lovely Christmas and I wish you fun on New Year’s eve. This entry was posted on December 26, 2014 by ReinisLacis in Around the NBA and tagged Christmas Games, Dion Waiters, John Wall, Kyrie Irving, Manu Ginobili, Matt Bonner.